5? 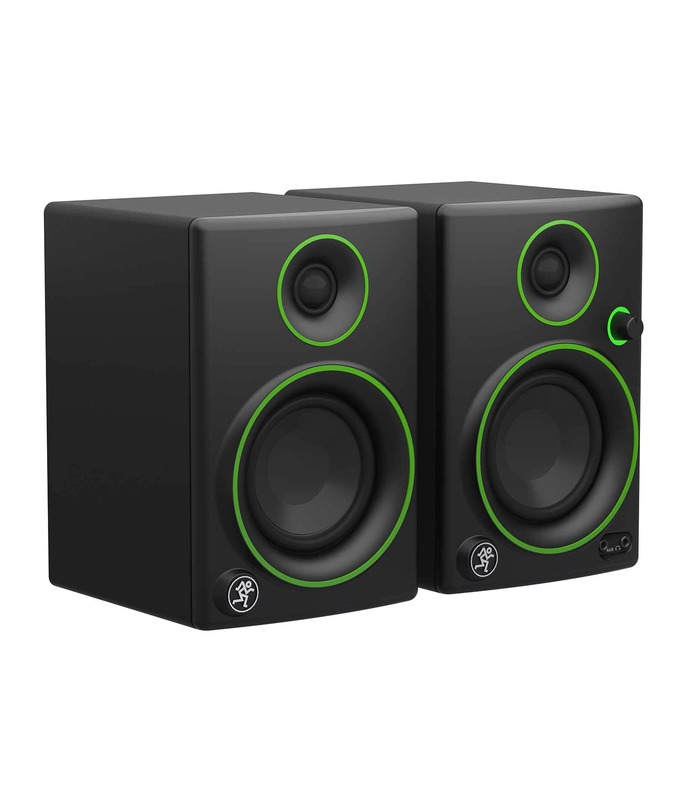 Multimedia Monitor with Bluetooth� (Pair) Compact and portable at 12 lb, this pair of 50W CR5BT Multimedia Monitors from Mackie provides audio playback in home and studio environments. As such, they are useful for mixing music or post production sound, and they boast Bluetooth capability to boot. 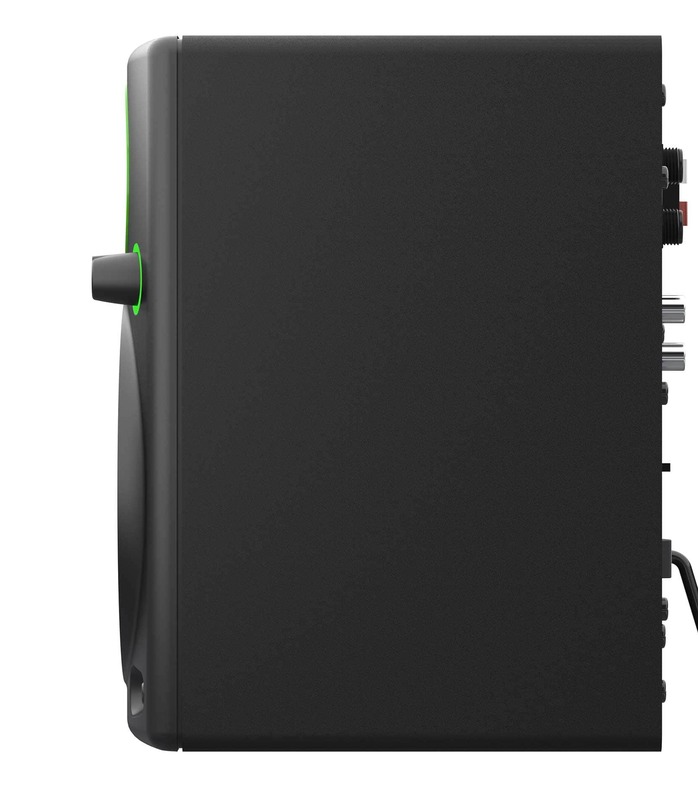 The pair consists of one Class AB amplifier-powered monitor and a passive un powered monitor that you can connect with an included stereo cable. For the low end, these speakers utilize 4" polypropylene-coated woofers and a rear port tube, while the highs are handled by 0.75" silk dome tweeters; all of this ensures a frequency response of 70 to 20,000 Hz with a maximum SPL of 100 dB. A switch allows you to select whether the powered speaker will function as the left or right monitor. This is particularly helpful when you must position the speakers near power outlets, or when you have to decide whether you'd rather have your front-panel volume knob situated on your left or right. Also adorning the monitor's front are an LED (indicating whether or not your monitors are on at any given time) and a dedicated headphone output (for private listening; please note that plugging your headphones in will silence the monitors themselves). You can connect mobile devices and other devices directly to the monitors via 1/8", 1/4" or RCA inputs but then again, feel free to skip all that and just go with Bluetooth. The monitors also come with isolation pads for reducing the transmission of structural vibrations. 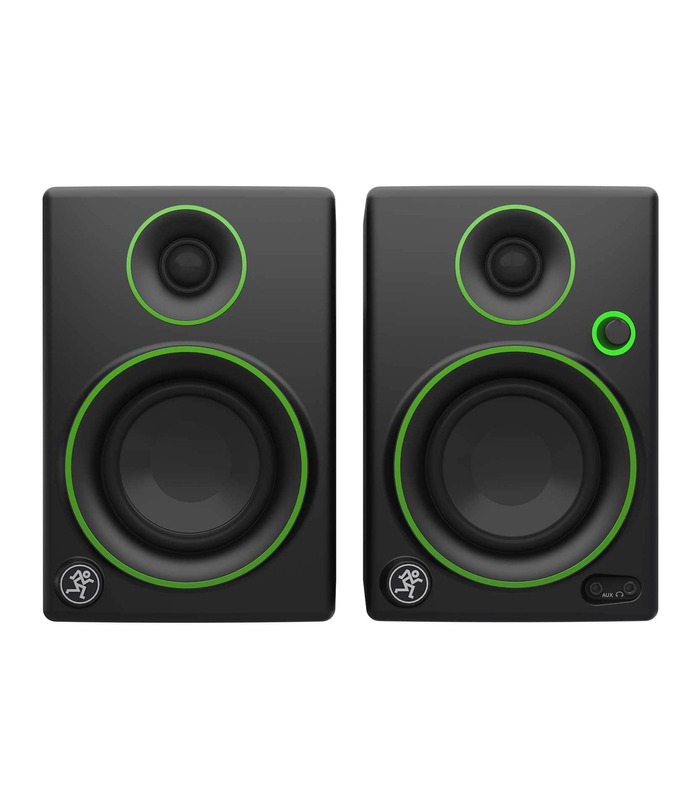 CR5BT Pair Reference Monitor from Mackie is 100% original and is available at NMK Electronics. Speak to our expert for booking a live demonstration. After sales customer service is an integral part of our business ethic and is taken very seriously. Any Question? Drop us an e-mail. We'll contact you back. An all new video series, "NMK Sessions" where we take you in-depth with the latest products in the AV Industry. Watch as we unbox and give a full product overview of the Shure MV88+. Shure TwinPlex stands up to the toughest conditions to make every word a clear statement of quality. Natural, flat high frequencies and robust low-frequencies. TwinPlex innovative dual-diaphragm captures the complete weight of your voice. It's the last day of NAB! We're at booth C6015 with all our great Broadcast products, including the just-announced TwinPlex line! To learn more about TwinPlex, visit https://t.co/iErcWLKzOH. Enter your e-mail below to subscribe to our free newsletter. We promise not to bother you often! Note: Reservations are on a “first come, first serve” basis. Cancellation policy: All cancellations must be received in writing 7 days prior to the first day of the seminar. NMK Electronics Ent. reserves the right to cancel or reschedule any seminar. DAY 2 : Hands On sessions on Eclipse-HX Matrix, FreeSpeak 2, HME DX410, LQ-Series, Agent-IC and Helixnet Digital Partyline. This curriculum covers advanced networking concepts, mixed-use networks, networking best practices and troubleshooting techniques. This new Advanced Track is geared toward attendees that are already using Dante, and are looking more education in understanding and managing Dante-enable networked systems. Prerequisite for Dante Level 3 Certification: Dante Certification Levels 1 and 2, take course online now. Interactive AV Solutions by Williams Sound/Pointmaker. - The history behind modern microphones, the fundamental science behind them, and how to apply best practices across a wide range of applications. - The basics of sound design and how it can be used to enhance the story telling as well as the drive of a film. - Learn about techniques used, the various elements in sound for a mix and also how it impacts the scene psychologically. - The art of mixing for visuals. The concept of blending elements to create a realistic sequence or a design sequence to enhance the story telling. Join Robert Scovill as he unveils the unrivaled flexibility and capabilities of the S6L Unified Platform. This massive extension of the S6L line of products offers a groundbreaking approach to digital console design while offering previously unrealized integration capabilities. The Unified Platform approach stands to evolve the manufacturing industry and redefine what is possible for today’s integrators and live sound mixers. Today’s digital consoles and processors present significant challenges for simultaneously optimizing gain structure for the event and for multi-track recording and virtual sound check. Join Robert Scovill for a best practices approach to achieving great sound quality from your console and processing through easy to apply gain structure concepts and techniques. Mishandling and misunderstanding of latency in a digital mixing environment is a hidden killer of sound quality in today’s digital mixing environments for music production. Join veteran concert sound engineer Robert Scovill as he shares and demonstrates a tried and true method for discovering and managing complex latencies in a digital mixing environment and demonstrating when and when not to deploy the concept. Join pioneer virtual sound check creator and pioneer Robert Scovill as he traces his footsteps on the path to developing one of the most important workflow developments in live sound mixing. Topics include: how to maximize your virtual sound check experience regardless of your console or DAW and tips on how to use virtual sound check to dramatically improve your live sound results for both FOH and Monitors. Robert is a 35-year veteran of professional concert sound and recording and has mixed over 3500 events in his career. His engineering and production talents have been enlisted by a veritable ‘Who’s Who’ of marquee music acts including Tom Petty & The Heartbreakers, Matchbox Twenty, Jackson Browne, Rush, Def Leppard, Prince and many others. Scovill’s body of live sound and recording work has garnered numerous industry accolades including 6 TEC Awards for technical and creative achievement in sound reinforcement. Robert is a 6 time nominee, 3 time winner of the PLSN Parnelli Award for live sound engineer of the year and has been a multi-year nominee for Mobile Production’s “Top Dog” Award along with being an inaugural nominee for the highly coveted Pensado Award for live sound excellence. In 2018 he was awarded the prestigious Lydmannen Award by the Nordic Sound Symposium for outstanding presentations on professional audio. As the owner of Eldon’s Boy Productions Inc. and MusiCanvas Recorders in Scottsdale, AZ, he offers full service mixing facility and mobile recording services. Robert is also a highly sought after consultant advising venues, artists, sound companies and the house of worship market on everything from technology, workflows and acoustics for their companies and events. As an educator, Robert has lectured throughout the world on concert sound and recording practices at seminars and trade shows, and is a regular contributor to numerous industry publications, blog sites and YouTube video series. Robert’s profile includes positions as a technical consultant for numerous top name manufacturers in professional audio, including Avid, EAW, Neumann, Audio Technica, Electrovoice, Servo Drive, and Alesis. He has held the title of endorser for numerous products, including Avid’s VENUE live sound environment, WAVE’s digital technology, Neumann Microphones, Radial Technologies, ATI Paragon, Intersonics loud speakers, Future Sonics ear monitors, and countless others throughout the years. In 2006 Robert served as guest speaker delivering the keynote address for the Annual AES conference in San Francisco and has gone on to be the keynote speaker and presenter for many professional audio organizations. Robert currently holds the position of Senior Specialist for live sound and recording products for Avid Technologies and serves as a principle designer and contributor for their VENUE line of live sound consoles. Scovill is commonly regarded as the pioneer of virtual sound check and mulita-track archiving workflows for live sound. Robert’s hobbies include endurance racing, snowboarding, archery, pistol and rifle sports. He has successfully completed the Lake Tahoe North/South Swim, The Alcatraz Swim Challenge, The Great Wall Marathon and World’s Toughest Mudder along with numerous other multi-sport events. Robert is very happily married father of three.